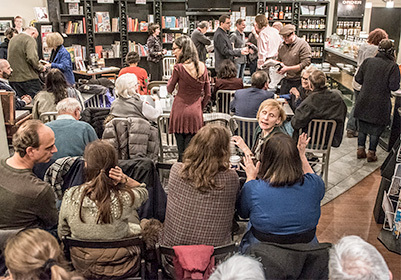 The winners of Chicago Writers Association's 2018 Book of the Year Awards were honored at a ceremony at The Book Cellar in Chicago's Lincoln Square on Saturday, January 19, 2019. Left to right: David Rapp, Francie Arenson Dickman, Linda Gartz, Cheryl L. Reed. The contest is open to members and non-members. Submissions open on June 1st and close on August 1st. Entries must have a publication date between July 1, 2018 and June 30, 2019 (date of first publication). We accept only hard copies (paperback or hardbound books) which must be mailed with an entry form and postmarked by August 1st to qualify. Download the entry form for the address. Digital books are not accepted. Published by the “Big 5”, independent publishers or small presses that do not charge the author a publishing fee. Self-published, print-on-demand, or published by a house that charges the author a publishing fee. Winners will receive a cash prize of $100, an engraved award, a $50 gift card to The Book Cellar, Book of the Year stickers for their books and publication of first chapter in CWA’s Write City Magazine.